Expanded Metal Grating and Expanded Catwalk Grating are economical solutions for industrial walking surfaces. Design engineers view it as an excellent choice when building maintenance and safety are important design criteria. Produced by slitting and stretching plate into an open diamond mesh; expanded metal grating permits a strong, durable, light weight walking surface. It has a high percentage of open area which allows excellent passage of heat and light to surfaces above and below. The angular position of the strand and the bond makes the expanded metal grating stronger in deflection than steel plate in its original form. The junctions of the strand and bond form a ridged surface for improved traction and slip resistance. Being made from one continuous piece of metal it yields a greater strength to weight ratio. The surface is naturally slip resistant and for that is used primarily for pedestrian traffic. Expanded metal grating allows snow, water and oil to drain off easily making a practical yet economical way to assure strength and safety in a walking surface. 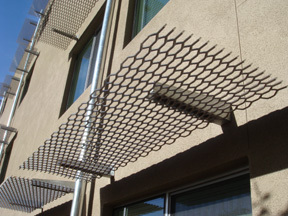 Expanded metal grating is available in carbon steel and aluminum. The weight per square foot and the shape of the diamond pattern determine the load capacity of the grating. Expanded metal tables provided above are a courtesy of NAAMM / EMMA (557-12). The styles listed may vary by weight and dimension based on the buyers’ specifications. If materials require documentation meeting EMMA / ASTM standards, such as government and / or code projects, advise your AMICO sales representative at time of inquiry or order. If reverse diamond materials are required, ask your AMICO sales representative for assistance. Standard sheet sizes range from 4ft (SWD) x 8ft (LWD) up to 6ft (SWD) x 12ft (LWD). For non-standard sheet sizes, contact your AMICO sales representatives.